Because he was an android, Wabsworth got to examine the contents of Jack's bag. "Perfectly good cocoa beans these. Excellent I'd say." The Wabbit was puzzled. He'd expected lethal toxins. "These are from Jinotega, Nicaragua," continued Wabsworth: "And you don't get better." "How the Binky can you tell?" gasped the Wabbit. "The smell corresponds with one I received from your memory," explained Wabsworth. For a brief moment the Wabbit saw himself hanging from the back of a truck. He could smell diesel and hear mortars in the jungle. He gritted his teeth. "What about the bag?" Wabsworth shrugged. "Just cocoa." The Wabbit frowned. "Then whatever it is, he still has it," said Wabsworth. 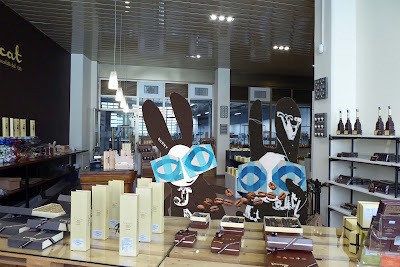 The Wabbit glanced back at the bag. "What did you put in the duplicate bag? What did Jumpback get?" asked Wabsworth. The Wabbit laughed. "A heap of old stuff lying at the back door." Wabsworth groaned as only an android could. "Batch 10 was awaiting collection by the Department." The Wabbit tried to look nonchalant and adjusted his glasses. "Samples only, for the trade." He nodded in agreement with himself. Wabsworth turned and gave the Wabbit one of his own grim stares. The Wabbit's insides shrank. "What was it?" Wabsworth searched in his fur for his automatic. "We have to get it back."